With all the bouncing, running, and lifting we do on the regular, it is nice to switch up your routine by trying something new! The Studio (MDR) is a total-body workout that brings together elements of Pilates, cardio training and weight-lifting, all done on a machine called the Megaformer. Every movement on this machine is slow and controlled, which allows you to really concentrate on specific muscles and with the consistent resistance throughout the workout, you will feel the burn! When you first walk into the studio, you get a traditional studio welcome, and the instructor reviews how to use the machine. With pulleys, levies, springs and moving platforms, there was a lot of information to go over in five minutes, so pay attention as close as possible. If you are anything like we are, you just go with the flow and look at the person next to you to get an idea of how to move. The class flows nonstop to the sounds of Drake, Migos, and Mariah Carey. It’s easy to get a little lost in class because the machine has a lot of parts to it. I spent more time figuring out how to use the levies, but boy when I got the move right, my body was shaking like crazy, in a good way. There were moments I felt like maybe I could not finish the class, but with motivational quotes all over the floor, literally, I felt like I couldn’t quit on myself. I’m not going to lie, sometimes I felt like I was at war with the Megaformer, but in the end, we came out as friends...or at least acquaintances. 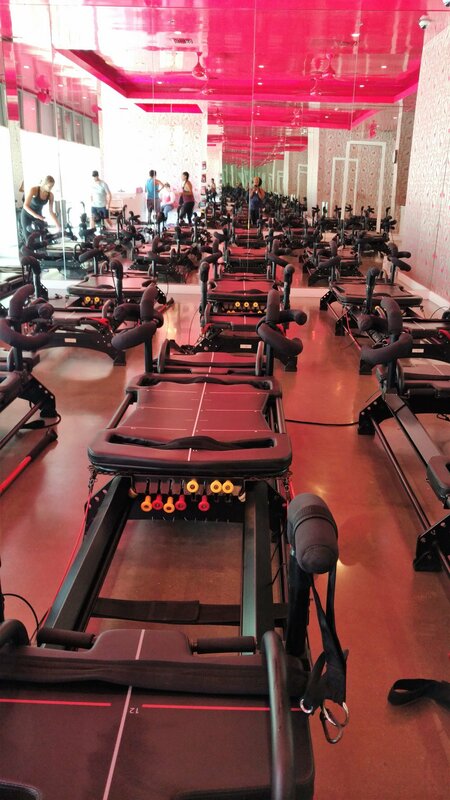 You are not required to bring anything the first time, but using the reformer machine can get a little slippery. All returning students are required to wear yoga/Pilates socks and we can see why! You might also want to bring a towel and some water because you are definitely going to sweat! Even if it's a light one. Your friend who is a little more zen, and a quick learner. Finesse Tip: Ask the instructor if there is any one in the class you should mirror if you get lost. The class moves very fast and it can be hard to know what's going on sometimes.